I had a chance to see a Doug Dorst at Kepler’s Bookstore last week. I got to know Dorst as one of his students in a fiction-writing course I took in 2003. Long story short, the former Stegner Fellow led a great class and later helped me with the novel I was completing. Along the way, I got to know a little more about Dorst. Apart from being a genuinely kindhearted and insightful guy, he’s also pretty damn multi-talented — he’s everything from a former lawyer to a three-time Jeopardy champion. So when I learned that his long-awaited novel, “Alive in Necropolis,” had been released by Three Rivers and was winning critical acclaim (The New York Times gave it a nice review, and Amazon named it one of their favorite books in July), I was thrilled for him. Seeing him read from “Alive” at Kepler’s was an added bonus. 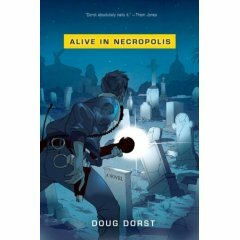 Dorst takes some big chances with “Alive,” does some interesting things, and makes it work, according to the large number of writers championing the book. At Kepler’s, he read the opening section and hooked a few more writers, including me. I bought a copy and added it to my ever-growing stack of unread books authored by friends. If there’s ever a reason to be happy about losing the battle against your reading stack, this is it.